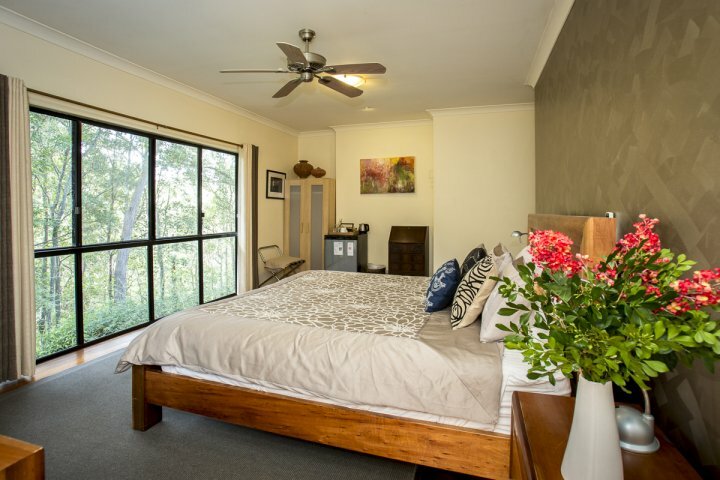 Featuring a spacious open-plan design and beautiful timber floors throughout, you have the room to relax and feel a million miles away from the hustle and bustle of the city. 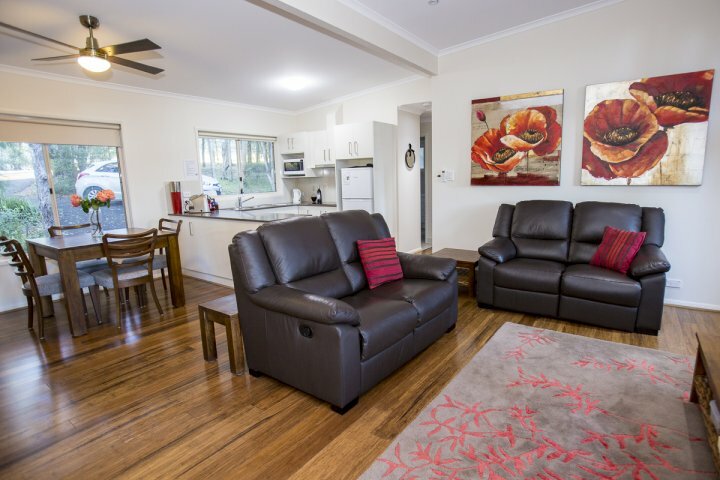 Take a walk on the 20 hectare property of natural bushland recently gazetted as the Boom-Ber-Pee (Koala) Private Nature Refuge, or nearby national parks. 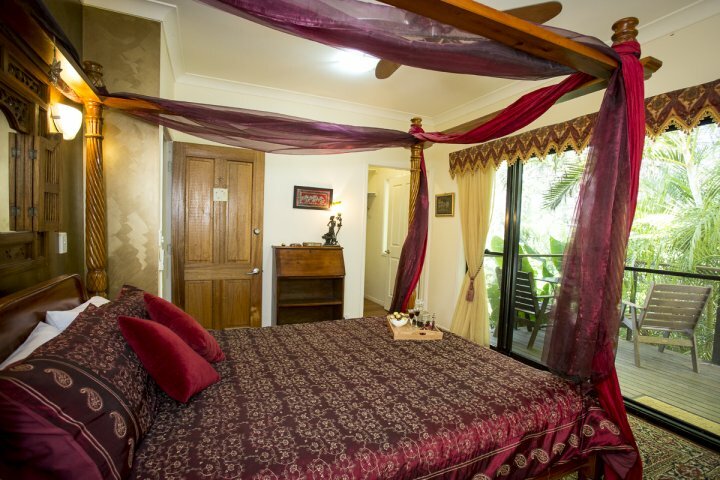 Visit Sirromet winery, take a dip in our tropical garden hot spa or just enjoy the luxury and privacy of your own room. 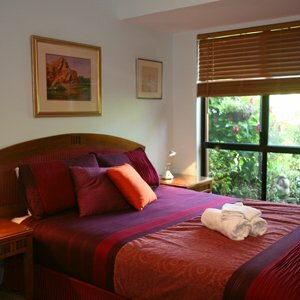 Your large and very comfortable rooms are beautifully furnished with quality fittings, linen and all the trimmings. 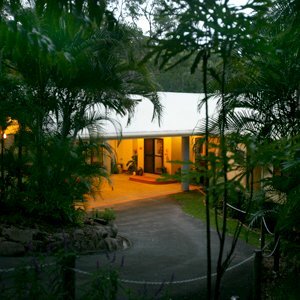 We welcome you to a perfect place to escape and rejuvenate. 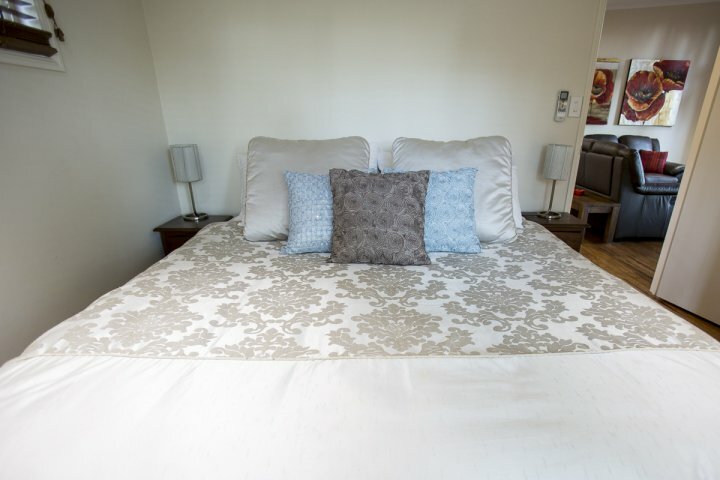 Rates include port and chocolates, as well as a full country breakfast each morning unless specifically excluded. Breakfast includes a hot selection including our free range eggs, bacon, chipolata sausages, and tomatoes. Also fruit juice, cereals, fruit salad, fresh toast and jams. 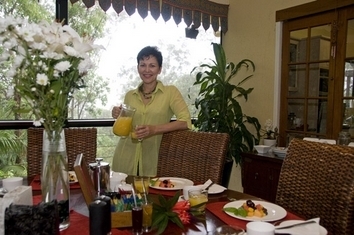 Breakfast is served on the main deck overlooking the bushland and parrots feeding, with glimpses of Stradbroke island. 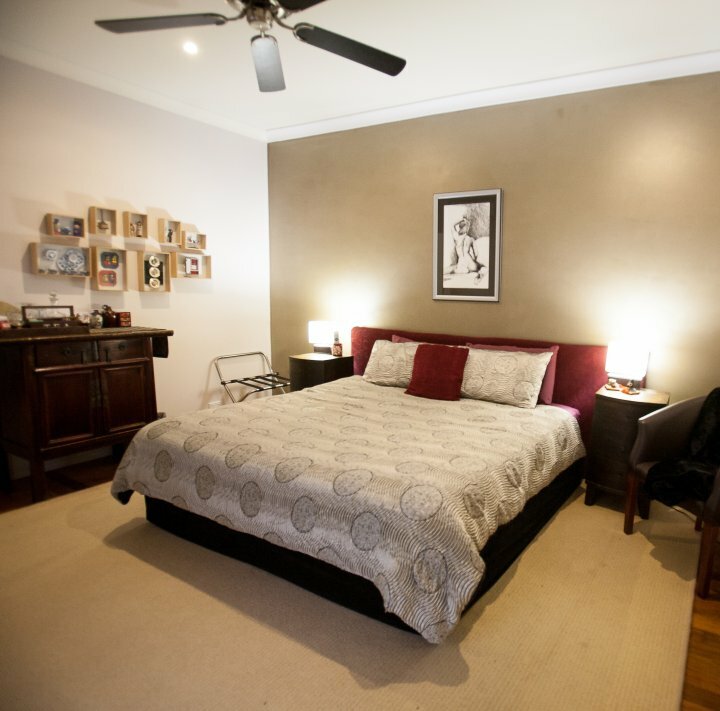 These 2 individually styled suites each consists of 2 bedrooms with a shared bathroom between. 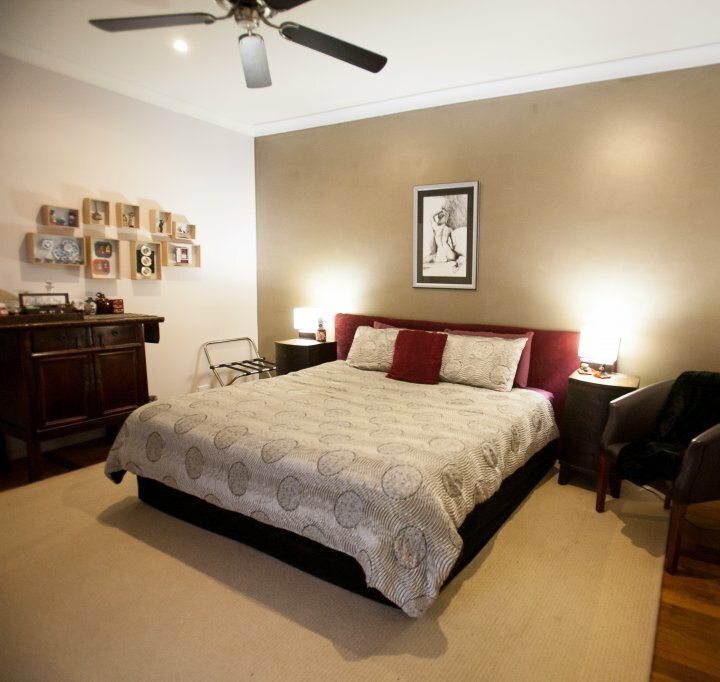 Both rooms have a comfortable Queen sized bed as well as a single bed set into the wall. 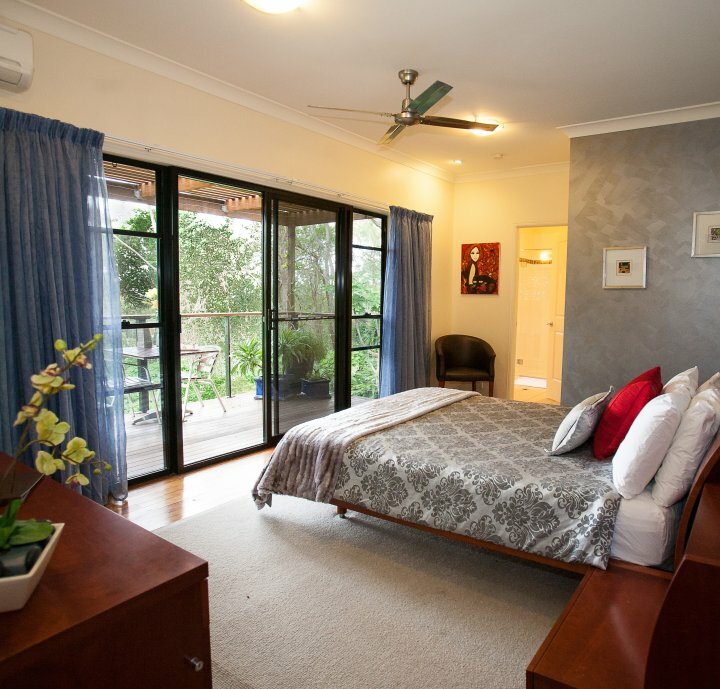 One room also includes a small patio overlooking the formal gardens and bushland. 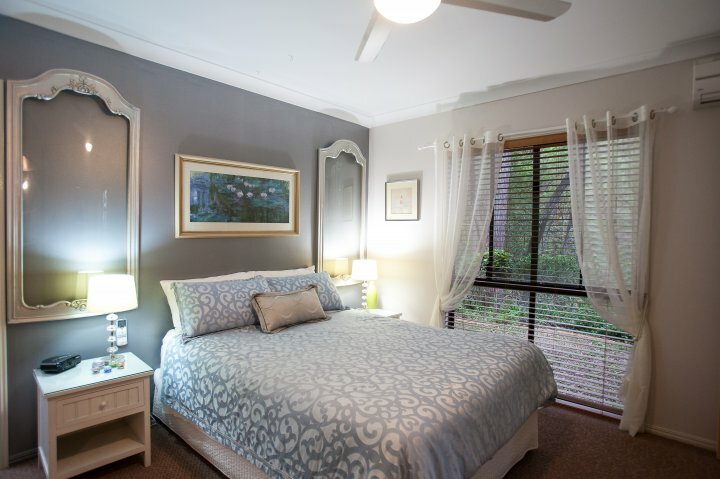 There are also ceiling fans, air conditioning, kitchenette facilities and minibar. 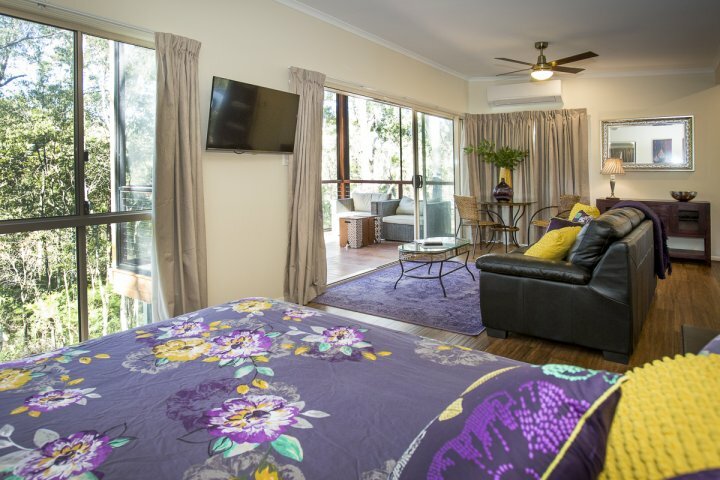 The suite also has access to its own adjoining private TV lounge and direct access to a shared large screened deck overlooking the gardens. 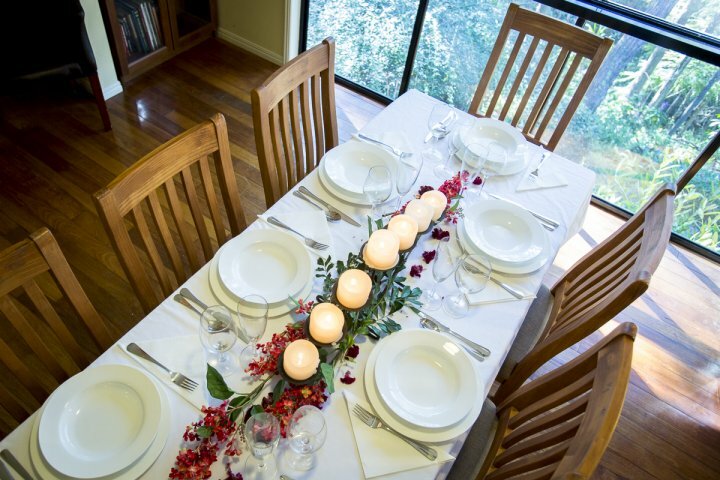 Great for two couples sharing or for family groups. 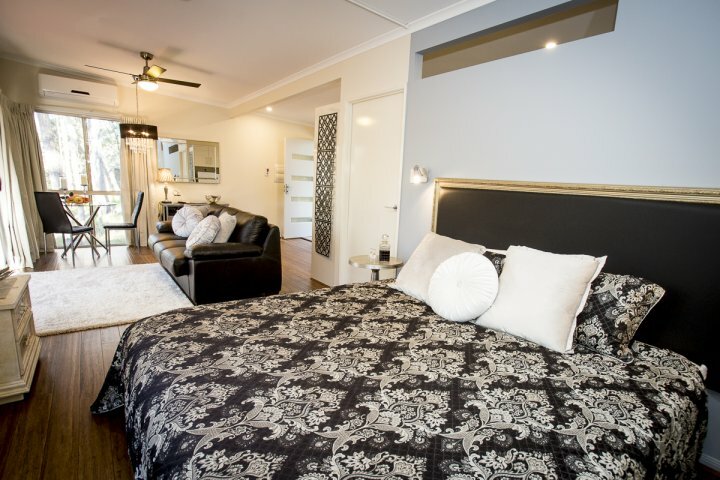 Each of the deluxe rooms are individually styled and are air-conditioned with comfortable Queen size bed, private bathroom with bath & heated towel rail, ceiling fans, private balcony, walk-in robe and fluffy bath robes, widescreen TV, tea & coffee making facilities and mini bar. This 2 bedroom pavilion has open plan kitchen/dining/lounge area with screened and covered deck so you can enjoy the outdoors in comfort. 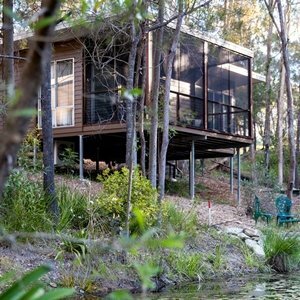 This beautiful open plan pavilion sits overlooking a beautiful lake surrounded by bushland. 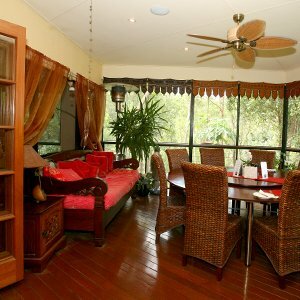 The large screened deck ensures that you can enjoy the outdoors in comfort. 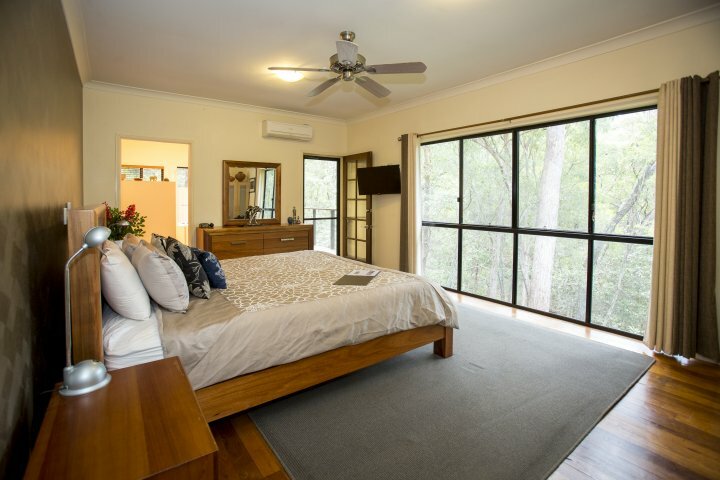 This beautiful open plan self contained and private pavilion sits overlooking a steep gully and looks out into the treetops by bushland. 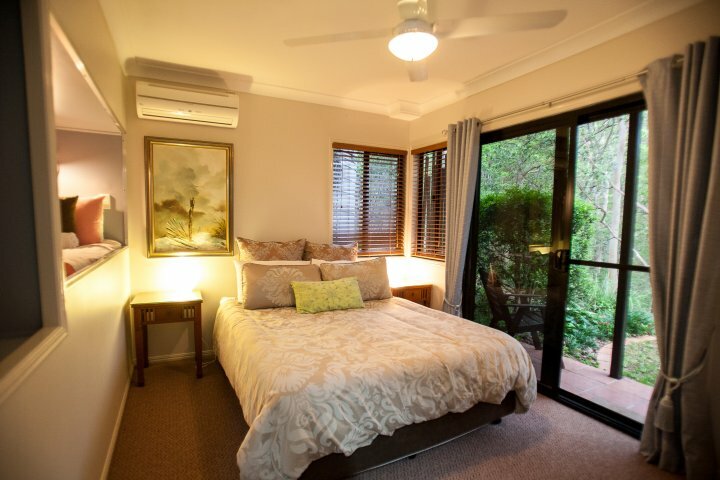 The large screened deck ensures that you can enjoy the outdoors in comfort. 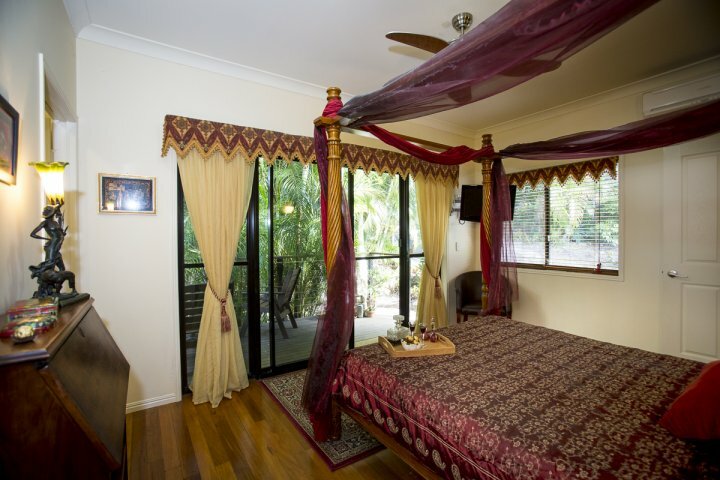 Stay 3 nights in one of our beautiful self contained Pavilions in the Treetops. 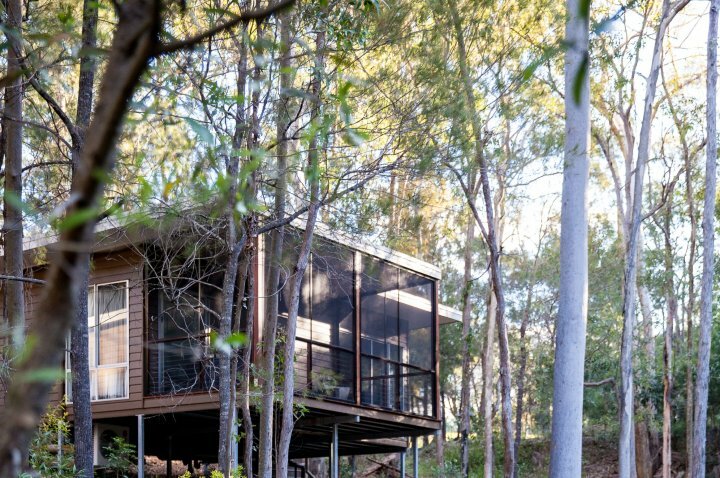 This beautiful open plan and private pavilion sits overlooking a steep gully and looks out into the treetops surrounded by bushland. 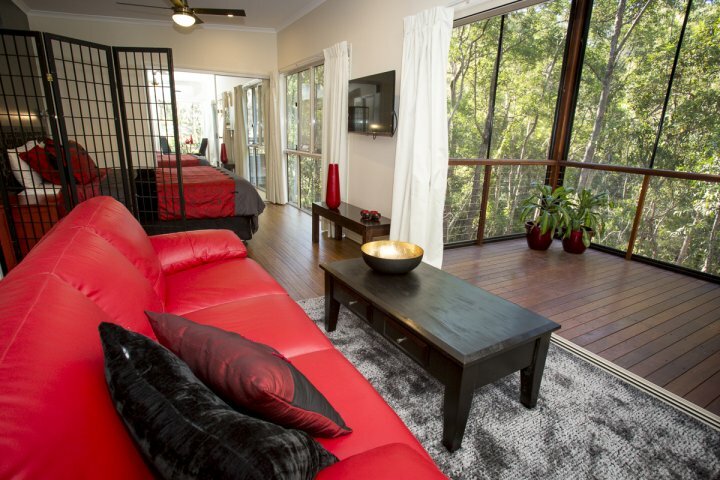 The large screened deck ensures that you can enjoy the outdoors in comfort. 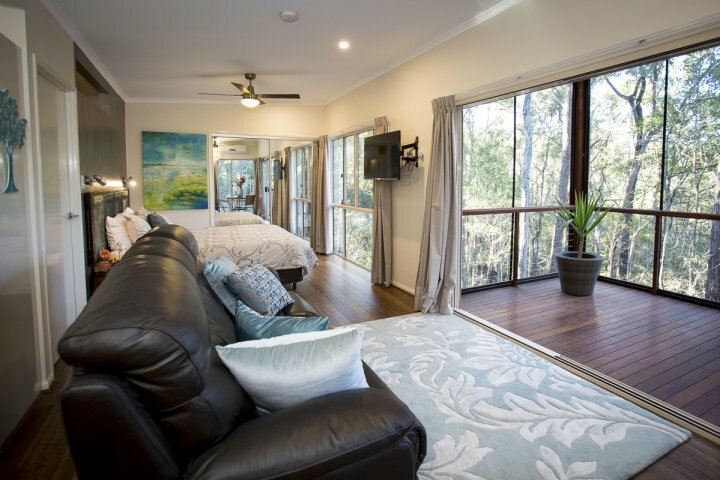 The Tangalooma Superior room is the best room in the house spacious, air conditioned, King bed and private deck offering an outlook of the forest and glade below. 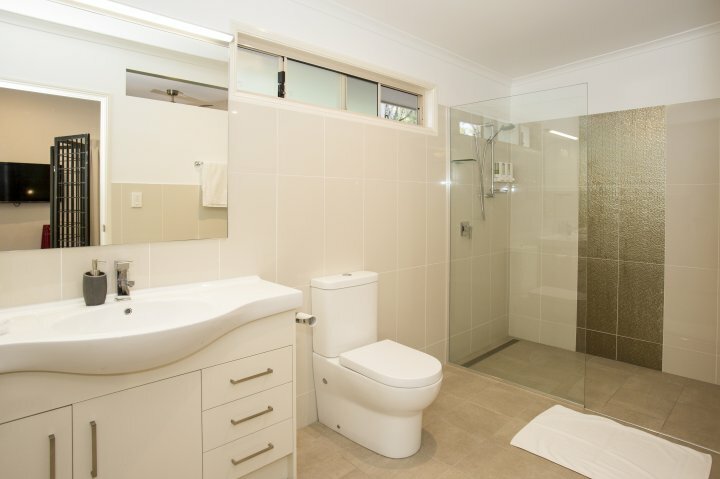 With spacious bathroom, ceiling fans, heated towel rails, mini bar and wide screen TV . 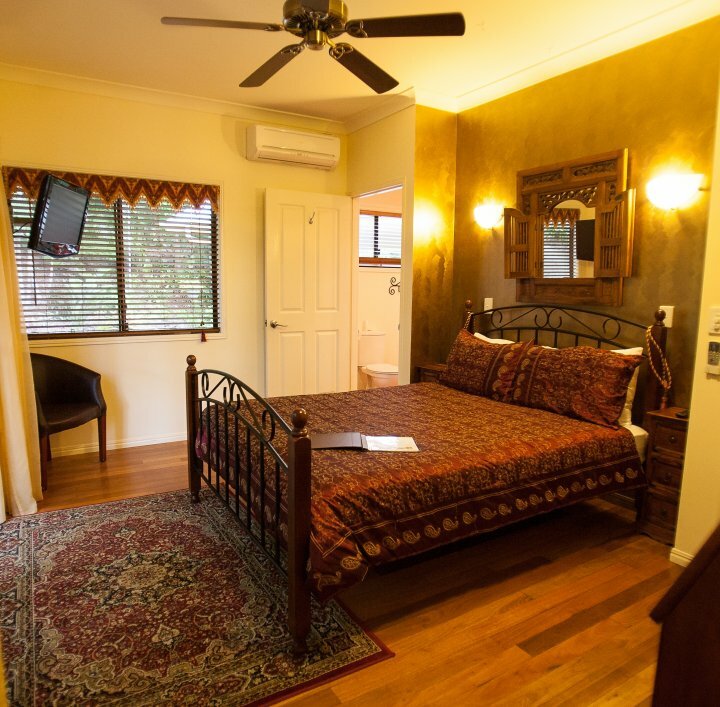 If you are looking for a relaxed setting for your next seminar, workshop or meeting, Mt Cotton Guesthouse offers you a great and very different setting and all within 30 minutes easy drive from Brisbane City or the Gold Coast. We provide a great meeting space suitable for 10-12 people with break out areas. 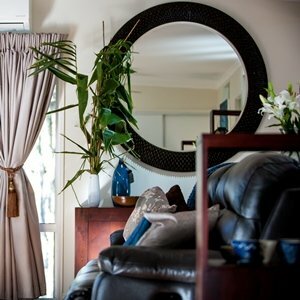 Alternatively you can take over the main dining, lounge and deck areas for a more relaxed approach to business planning, direction setting and sales forecasting, meditation courses or leadership development training. To take the work out of arranging a seminar of mini conference, we can provide full catering and arrange your audio visual requirements. We have a MT COTTON GUESTHOUSE sign at the front and the street number 355 . Proceed down driveway and keep to the right to the parking area. Please note some GPS's don't recognize this address correctly so please use our directions or go to whereis.com.au. 4. Go through another 2 round abouts and at the 3rd round about turn LEFT still on California Creek Rd. 6. Travel 2km up the hill watch as the speed limit is 60kph. 7. Just before our main entrance is a large Mt Cotton Retreat sign on your RIGHT. 8. 50m after this sign is the main entry. 9. 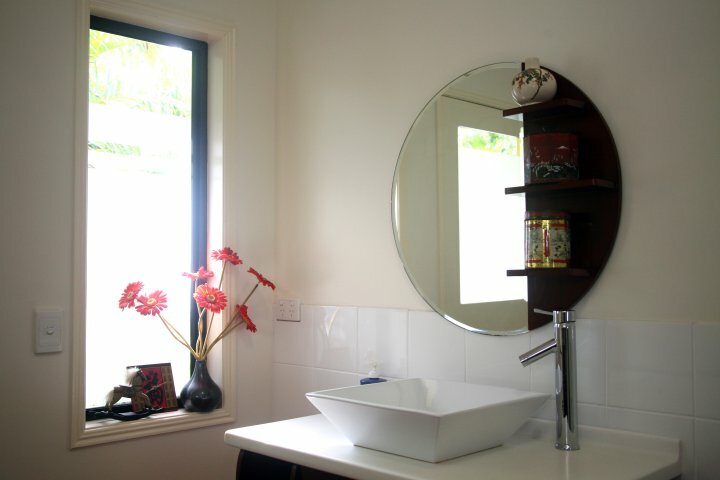 Drive down the driveway and park in the Visitors Car park and hear to reception at the main ochre coloured house. 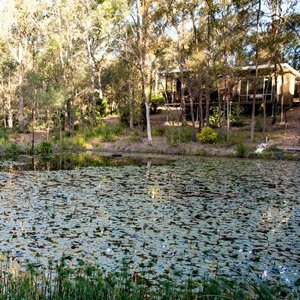 Bird Watching - We have over 80 species formally identified on our property including the rare Glossy Black Cockatoo and Sulphur Crested Cockatoos, the Pale Headed Rosellas and the beautiful King Parrots - and that's just the early birds! Wallabies, koalas and the odd echidna also visit. 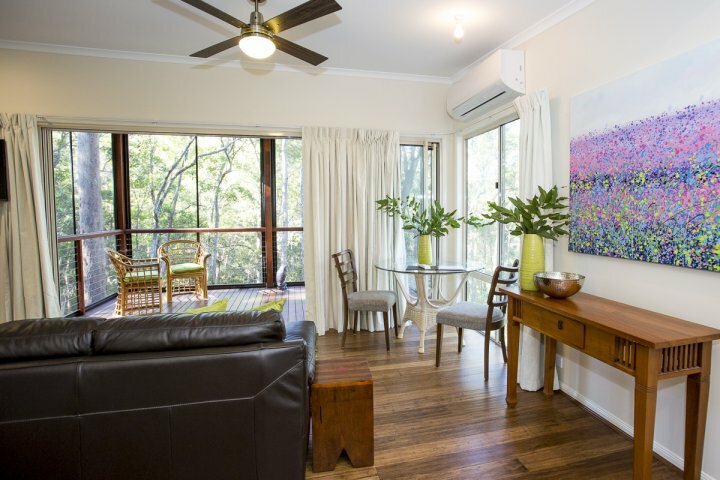 Because the house is set high in the trees, you can view birds and the bush in a way that you don't often experience. Our outdoor heated hot tub is set amongst a tropical Balinese garden and helps relieve those tired muscles and invigorate your spirit. 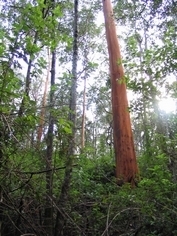 Bushwalking - There are a range of easy to moderate bush walks at the nearby Venman National Bushland Park which is only 1.2 km away and the regional trail will be constructed in 2015 beside our boundary linking guests to kms of walking and cycling trails. There are BBQs with wood provided and a well maintained picnic area where there are nearly always wallabies, many birds and if you are lucky koalas!